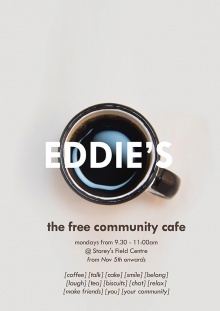 Eddie's - a free community café at the Storey’s Field Centre runs every Monday from 9:30am to 11am at Eddington. Come and start the week by enjoying a free cake and a chat! As the Cricket World Cup returns to England and Wales for the first time in 20 years, the International Cricket Council and England and Wales Cricket Board aim to engage 1 million children throughout the tournament. 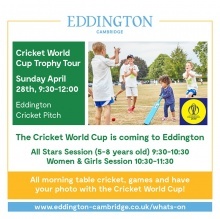 The Eddington event, on Sunday 28 April, will feature an All Stars Cricket session from 9.30am and a women and girls’ Softball Cricket session from 10.30am. Cricket enthusiasts will be able to play recreational cricket and table cricket throughout the morning. foodPark will be at Eddington every Friday with a rotating selection of street food trucks, serving the finest street-side lunches from 12-2pm. Come and feast on food from The Wandering Yak, Guerrilla Kitchen, The Tin Kitchen and Steak and Honour in the Market Square.